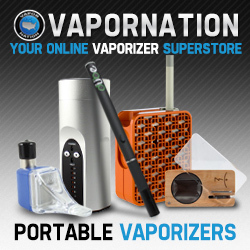 This amazing portable vaporizer comes complete with the capacity of heat controlling options! You have the choice to choose between 7 different temperature options when you are consuming dry herb products. This fantastic Canadian vaporizer is promoted for its glass components that are placed directly on more glass also known as glass on glass operation. This outstanding vaporizer is the ultimate size. It will fit precisely in a person’s hand! The way these folks put this vaporizer together is sturdy and truly made with great quality. It is very lightweight. Weighing in at 2 lbs. not only it is small but also won’t weigh you down! It does come with the need for a little bit of instruction and attention to learning how it works. You will first want to charge the awesome battery that is made of lithium. Once you have done this, the battery should keep ya going for three hours or so. To operate, you will want to press the up and down button at the same time to turn it on, then the LED light will show you your battery life. With seven different choices for the temperature, you really are equipped with some options. Hit the up button to make the vaping process happen. 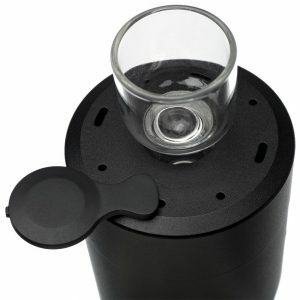 Once you have picked your desired temperature, the Arizer vaporizers will heat up in approximately 1-3 minutes. That also seems to be just enough time to put your product in the diffuser. Once you have loaded the compartment and the temperature is at its place, you can put the diffuser into the top of the vaporizer. There is very little that is compromised in terms of your product due to the compact fit of all the working parts! This is all very important for who wants to waste anything when vaping? The part that heats the vaporizer will run for 12 minutes, and if you choose to be finished before that time elapses, you will go thru the process you did of turning it on. (Pushing both buttons at the same time!) Please be careful of the glass for it will get hot! You may want to take the time to let the SOLO cool before putting it away. Large temperature range: SEVEN choices! 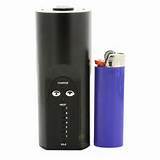 Even though this is a great vaporizer, it does have the capacity to burn you if you are not careful. On the other hand, it does produce solid vapor production. Some say that the weight of the machine is a detrimental component also. It works quite well while you are resting at home. It does do a great job! The fact that it is much less expensive than that of other vaporizers out on the market today, you may just give this ARIZER SOLO a try. You will not be disappointed. Running at around $225, you are getting a great vape for a fairly low price! Try one today!